The crowd at Abu Dhabi’s Indian Embassy fidgeted in their seats during the introductory remarks. After several speeches, profuse thanks, and an unexpected break for refreshment, the lights dimmed. A red handkerchief fell from the sky: the opening scene of Shyam Benegal’s film Zubeidaa. The narrative is structured as a story within a story. As journalist Riyaz researches his mother Zubeidaa’s life, her story is narrated through a series of flashbacks triggered by the different people he meets. 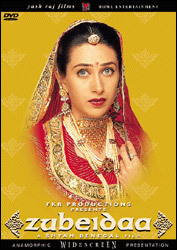 Through this complex telling of Zubeidaa’s story, Benegal portrays many of the issues in Indian society in the late 20th century: gender inequality, the constraint imposed upon women by societal expectations, the social status of Muslims in a Hindu society, and the political struggles in India as democracy emerged and disempowered aristocratic ruling families. Despite describing his cinematic style as alternative, however, Zubeidaa was certainly the most “Bollywood” of Benegal’s films. Not only did it incorporate song and dance, but Zubeidaa is also, at heart, a love story. In a master class held with NYU Abu Dhabi students, Benegal was asked why he included these elements in Zubeidaa despite his rejection of the traditional mechanisms of Bollywood cinema. His answer not only resonated with Zubeidaa’s story, but also underlined what he thinks is important in cinema in itself. “The story itself was like a little fairy tale. Zubeidaa was a kind of fairy tale princess, but she came to a tragic end. I wanted to give it a slightly larger-than-life element of fantasy.” The contrast between the idea of fantasy and the fact that Zubeidaa is based on a true story illustrates the multi-layered nature of Benegal’s cinema. He asserts that watching one of his films is not about blind acceptance of what is happening, but should be a “discerning experience” in which viewers should consider cinematic elements as they enhance the message of the story. While watching Zubeidaa, I was entertained by the dancing scenes and intrigued by the narrative structure. However, as a viewer I was unable to discern how the presence of storytelling and the ethereal dancing scenes turned Zubeidaa into a fairy tale princess. As a modern viewer, I failed to discern Benegal’s message. Audience discernment, especially about modern Hollywood cinema is eroding, mostly through lack of practice Throughout the master class, Benegal made a distinction between individually created work and films churned out by a “mass machine.” Benegal’s films strive to tell stories that have personal resonance; for example, the three films screened during the weekend were based on the screenwriter’s family. This personalization is getting harder to accomplish each day. Sophomore Hasan Nabulsi noted the growing disconnect between people and films and how difficult it is to immerse the modern audience in a film. It is difficult for the audience to transcend the surface of the film to see that every element is used to reinforce a meaning; while watching Zubeidaa, I was swept up by what was going on in the surface and dismissed it as Bollywood entertainment. In response to his critique of the disconnect between modern audiences and film, Nikolai Kozak asked Benegal what he thinks about the role of new technology in shaping the voice of our younger generation. Benegal responded, “Often, we become subservient to technology. Instead of becoming masters of technology, we become slaves to it. The technology itself seduces you in so many ways.” As Benegal stated this, I thought back to the film screening and found myself guilty of checking my phone for every text or email while the story was unfolding. Benegal asserted that it is necessary to clear our minds, to “constantly unclutter ourselves,” not only while watching movies but also while producing them. Mass media plays a role in disseminating the work of a modern artist, but it also presents a challenge; it is the role of the modern artist and filmmaker to go back, relearn, and adapt in order to continue being relevant not only to others, but also to oneself. The process of learning is important to a modern artist and a modern audience. As I took in Benegal’s conversation about Zubeidaa, I went back and reevaluated my experience of the film. It was, in itself, an educational experience. As the master class came to a close, students stayed behind to thank Shyam Benegal and seize whatever minutes they had left for conversation. In a closing remark, Benegal stated, “When you walk on the road, where do you think it will lead? That’s not important. The journey itself is important. You become the road.” By telling stories he considers personally relevant to his life, we are able to reflect on Benegal’s lifetime achievement and see it for what it is: a work of art.